I’m happy to tell you that the development of our new research system is slowly approaching the finish line. Last time I have shown you the tech tree layouts, and as promised, now you’ll get a glimpse of how it will actually look in the game. Not only that, but we’ll also have a look at how our entry to Steam is coming along, which is also being developed in the background. Your new playground for item research will have a separate place of its own in the main menu, so we’ll remove the current knowledgebase from the already overcrowded Agent profile window. As you can see, the window includes both tabs for personal and corporation research, and just like in the case of the colony management interface, the latter will be only visible if you have the proper “read rights” in your corporation. The grid is obviously where the magic happens, all the items available for research will be laid out there, like you’ve seen in the previous post. 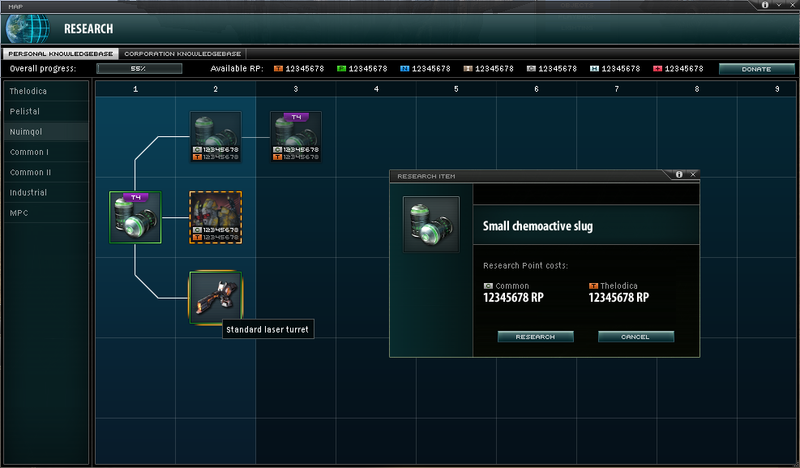 Locked items will be dimmed and will show the required RP amounts and types. What may not be obvious at first are the icon frames: green is the color of the personal knowledgebase, and yellow is the color of the corporation knowledgebase. Unlocked items will have a solid frame with the appropriate color depending on which knowledgebase you’re looking at, and a dashed frame will mean that the item is unlocked in the other knowledgebase. 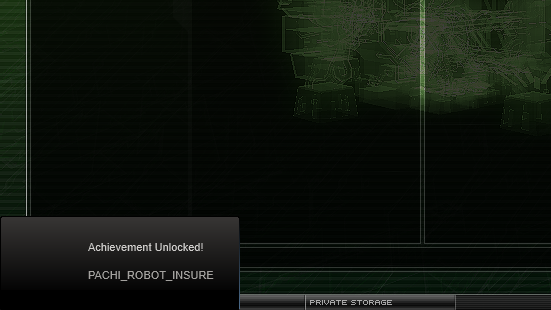 Items with a double green-yellow frame mean that they have been unlocked in both your personal and in the corporation knowledgebase as well, and receive a production bonus. While we’re at it, I should mention that this bonus will affect production in the factory and in the prototype facility as well. In the factory the item will receive a yet-to-be-determined material and time efficiency point bonus, and the prototype facility will work with halved material multipliers (5x instead of the normal 10x). This should make it well worth to aim for this combo research bonus. Since it has caused some uproar on the forum, you have probably heard by now that we’ll also introduce new research extensions, which will enable the unlocking of items on a grid column-per-extension level basis. The level of these extensions and consequently the availability of research will be indicated by the dark blue and lighter blue grid background, as you can see on the above image. I should also tell you that these extensions will have a complexity of 1, so they shouldn’t be so heavy on your EP-wallets. The current “Research” extension will be removed from the game and we’ll of course reimburse the EP for it. We have considered to keep it and let it provide a point bonus when consuming kernels, but it felt like a mandatory extension for everyone interested in research, so we dropped the idea. We are also considering a buyback option for already researched items, where you could regain spent RP with a certain loss of points. This may not be available from the get-go, but we’re developing the system with this in mind. Once that is complete, we’ll try to put together a test server for anyone interested in helping squishing some bugs. We’ll keep you posted when the time comes. Besides pushing the new major features, the Steam integration is also coming along nicely in the background. Although it wasn’t mentioned in the patch notes, the recent updates did some fixing with the Steam overlay, which works properly now. We already have a working (but yet hidden) Steam account linking option on our website, which already makes it possible to log into the game through Steam, without having to enter an email and a password in the game. How exactly account linking will work and all the details will be revealed in a later post, once we have it all set up and ready. I’d also like to stress that using Steam will be entirely optional: if you don’t have it or don’t want to use it, you will be able to continue playing with the normal game client just like now. Lastly, what would a Steam integration be without achievements? I’m happy to tell you that we’re working on that too, and we’ll have some interesting achievements to aim for when we launch on Steam. When? If all goes well, we’ll be there by the end of summer.